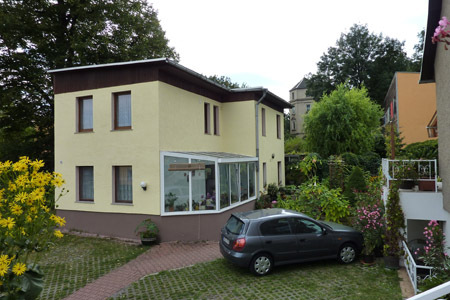 Our Bed and Breakfast accommodation "Hotel Garni" is located in the district "Leutewitz" in Dresden in a quiet and convenient location. The historic city of Dresden can be reached from our house in a few minutes. The tram stop is only 50 meters from our accommodation away. From Dresden Airport it is about 10 km to our guesthouse. We serve an extensive and very good breakfast buffet, which is included in our room rates. Free parking lots are located on the property. Free wireless Internet access is available to all our guests. In the immediate vicinity there are restaurants and parks for short walks. Our guesthouse is a good starting point for the many historic sights of Dresden, as the Dresden Zwinger, the Frauenkirche, the Castle, the Semper Opera Dresden, the zoo and the city museums. Trips to the Saxon Switzerland or Pillnitz are possible by car or public transport.